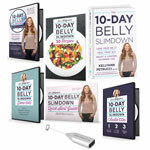 In the 10 Day Belly Slimdown with Dr. Kellyann, Dr. Kellyann shares her powerful, proven plan for blasting belly fat quickly and safely. Dr. Kellyann shows us how to lose your belly and heal your gut, with the added bonus that you look and feel younger. With over 20 years of experience as a naturopathic physician and nutrition consultant, Dr. Kellyann guides clients through thousands of fast and fabulous transformations.